Wicca, or the Craft, is a Neo-pagan (meaning "new pagan") religion popularized by a British man named Gerald Gardner in the 1940s. Gardner called Wicca the "witch cult" and "witchcraft" and its followers the "Wica". The word "Wicca" means "Witch" in Old English. People who follow Wicca are called "Wiccans." There are many different traditions of Wicca, yet many are common beliefs shared by all Wiccans, such as the afterlife, magic and morality. Not all Wiccans believe in a god and goddess. Some of those that do, believe that the god and goddess are equal. Others believe the goddess is more important than the god. 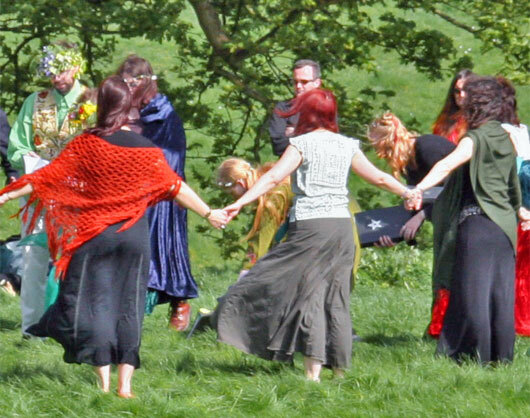 There are some Wiccans who mostly worship the goddess only. The god and goddess can split into different gods and goddesses. A pentagram. This is an old symbol of a five-pointed star. A pentacle is a five-pointed star that is surrounded by a circle. It represents the five core elements of Earth, Air, Fire, Water, and Spirit. 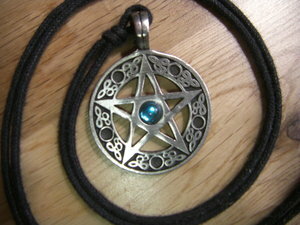 A pentagram is a type of pentacle, which is anything that protects the person who owns it, called a talisman. An Athamé. This is a magical knife (or sword) used in ritual. It is traditional to have a black handle, but not everyone does. It is never used to cut anything, but is used to 'cut' the air, and to direct energy. The athamé is also a symbol for man and God. A Wand. This is normally wooden, but can also be glass, metal, or clay. It might also have decorations such as crystals, paint, ribbons, or wire. It is used like the athamé to direct energy, and it is traditional for it to be the length from your elbow to your wrist. It also symbolizes man and God. A Chalice. This is a cup used within ritual and magic. People drink from it during ritual. It symbolises women and the Goddess. Some Wiccans put other objects on their altars, such as statues Gods or Goddesses, a bell, candles, incense, and a broom (called a besom), used to "sweep" away negative energy or spirits. Some believe it means whatever you send out into the world, good or bad, will return to you time three. Others believe whatever you do can take effect on three different levels: the mental, spiritual and physical levels. Although not all Wiccans adhere specifically to the "Rule of Threefold Return" belief, most Wiccans do adhere to some type of belief in which actions are returned in some way to the individual. Samhain, aka Halloween 31st October 30th April, or 1st May Celtic (see also the Celts) Death and the ancestors. Yuletide 21st or 22nd December 21st June Germanic Paganism Winter Solstice and the rebirth of the sun. Imbolc, aka Candlemas 1st or 2nd February 1st August Celtic (see also the Celts) First signs of spring. Ostara 21st or 22nd March 21st or 22nd September Germanic Paganism Spring Equinox and the beginning of spring. Beltaine aka May Eve, or May Day 30th April or 1st May 1st November Celtic (see also the Celts) The full flowering of spring. Fairy folk. Litha 21st or 22nd June 21st December Summer Solstice. Lughnasadh aka Lammas 1st or 2nd August 1st February Celtic (see also the Celts) The harvest of grain. Mabon aka Modron 21st or 22nd September 21st March No historical pagan equivalent. Autumn Equinox. The harvest of fruit. In Wicca, a private book containing spells, rituals, potions, and occult knowledge, called a Book of Shadows, is kept. In some types of Wicca, such as Gardnerian Wiccan, the contents of the Book are kept secret from anyone but other members of the group, or coven. However, some versions of the Book have been published. Some parts of these published versions, such as the "Wiccan Rede" and the "Charge of the Goddess" have been used by non-Wiccans or eclectic Wiccans. Many eclectics create their own personal books, and keep them to themselves. An early band called Themis toured Canada and the USA singing and talking about Wicca. The Themis body of works promotes things that are Wiccan such as the divinity of nature; the Lord and Lady (dual deity aspect of Wicca) and an ethical credo that resembles Wiccan philosophies. Wicca Facts for Kids. Kiddle Encyclopedia.